Fashion stylist and creative director Cassie Anderson is known for her fashion-forward aesthetic. Not only does she work with some of Australia’s biggest celebrities and brands, she’s also recently launched her very own accessories label, Balincourt. Today, we catch up with Cass to find out how she juggles her career and fledgeling brand plus we get her top tips for creating THE perfect shot. HI CASS! CAN YOU TELL US A LITTLE ABOUT YOURSELF AND HOW YOU GOT STARTED IN THE INDUSTRY? I grew up in Tasmania and left for London when I was 20 to chase my travelling and fashion dreams! I took a fashion styling course in London at Central Saint Martins, then followed that up with a fashion business course in Sydney at FBI Fashion College. This opened me up to some really valuable work experience opportunities. I then took a position at Cue and worked my way up through PR and business roles, to become Head of Online Styling and Accessory Developer. 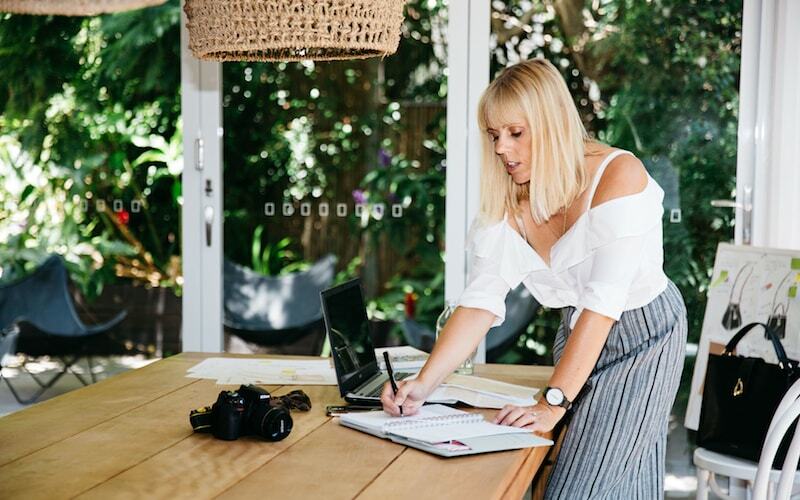 Now I call Byron Bay home, style as a freelancer and run my online bag business Balincourt. CAN YOU DESCRIBE YOUR TYPICAL DAY FOR US – IF THAT EVEN EXISTS! Yes, there isn’t really a typical day! I don’t generally have a set Mon- Fri working week as I may get booked for a styling job that’s on a Saturday or have something on a Tuesday that needs the full weekend to prep for. Call times for shoots differ too. Sometimes it’s a pre-dawn start, next week I’m doing fittings with an influencer starting at 8pm. I just slot in days off when I can. I usually get through any ‘full attention span’ tasks in the mornings! Like signing off production/design/graphics/images for my bags, looking at updates or improvements for my website and store to run smoothly, writing copy or a blog post, emailing brands or PR agencies to co-ordinate loaning samples for a shoot. Then in the afternoons, I try to focus on creative things like artwork, putting together looks, looking at references for styling or what’s happening in the international fashion world that is relevant. CONGRATS ON THE LAUNCH OF YOUR OWN BRAND BALINCOURT! 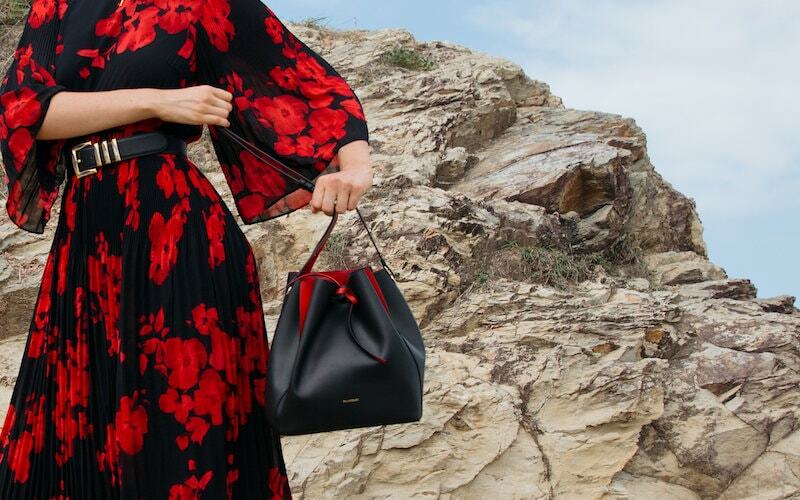 WHAT INSPIRED YOU TO CREATE AN ACCESSORIES LABEL AND HOW HAS THE JOURNEY BEEN SO FAR? Thank you! It has literally been up and open for about 5 weeks so it’s still very new! I have wanted to create my own accessories for a while now. After developing the accessories for Cue Clothing Co for 8 years I felt like I could use that invaluable experience to try and create something of my own. I wanted to create accessories for the right reasons – quality, sustainability and positive change became the core of the Balincourt brand. I wanted to make them limited edition and be produced by skilled people with the highest quality materials. The local fashion community in Byron has been a big inspiration, there is such a commitment to creating beautiful fashion in line with responsible and sustainable business practices and I draw from that. The journey so far has been one pretty big learning curve, particularly for the marketing side of things. Previously at Cue I would bring a range through, it goes out to stores and the girls on the shop floor sell it – now it’s a constant hustle on my own, from every aspect, to make sure I can get it seen at all! WHAT WOULD YOU SAY IS THE MOST CHALLENGING PART OF RUNNING YOUR BUSINESS/S? Being in a one-woman business can sometimes be quite lonely. It’s so important to network within your community, the business community and fashion industry. Never switching off can be pretty challenging and exhausting. I find myself waking up and thinking about the smallest details at 3am in the morning! It’s hard to stop thinking about your business at the end of the working day. I am determined to learn how to switch off though, I think you need to, for your own and your loved one’s sanity! YOU RECENTLY STYLED AND SHOT CONTENT FOR ONE OF OUR LOVELY FLAUNTER BRANDS – STITCH & HIDE – WHAT ADVICE CAN YOU GIVE TO OUR READERS WHEN THINKING ABOUT THEIR OWN CONTENT CREATION? I absolutely loved being behind the camera for this one, as well as doing the styling. The team at Stitch & Hide are so great to work with, they really let me go for it. When creating a flat-lay or still life set up, I try to think about making a realistic snapshot of someone’s life, not just a pretty picture. Who is this girl? What is she actually doing in this shot? Is she getting ready to go out at night? I might include a clutch bag with a lipstick, a credit card, some jewellery. Is she lounging in bed on a Sunday morning shopping online? I might then put everything on some soft linen, maybe with a laptop, magazine, coffee cup. This way I think the viewer can really imagine themselves in that situation and it becomes more real. WHAT ARE 3 FASHION ITEMS OR TRICKS THAT NEVER LET YOU DOWN? On a shoot, I like to call it ‘fudging’ something. I would never be without a bulldog clip or 4! They are so handy for making a garment fit in all the right places on a model, I’ve also used them to pull in boots that gape at the ankle and allowing a necklace to sit at just the right length. A must-have fashion item for me is a wide leg jumpsuit. The right cut can look very chic while at the same time so practical as I need to be up and down all-day dressing models and there is always plenty of pocket space for my bulldog clips and pins! Last little trick – when shooting garments on ghost mannequin, to make the hem of say a dress or pant sit out nice and evenly, I tape fishing line just under the hem and then hold the fishing line out of shot at just the right angle. This gives a nice lift and shape and then the fishing line is easy to remove in post-production. WHO DO YOU TURN TO FOR STYLE INSPIRATION? ANY FAVE INSTAGRAM ACCOUNTS THAT WE NEED TO FOLLOW?! I’m really into the bright colours and quirky styling @delpozo at the moment. I love looking at what Viktoria Rader of @vikyandthekid does with her styling. She has a sense of polish but makes it look a little off-beat. Lauren Santo Domingo @thelsd is the founder of Moda Operandi and you can count on her for some super stylish interiors and fashion posts. AND ONE FOR US! AS A REGULAR FLAUNTER USER, HOW DOES THE PLATFORM HELP YOU DO YOUR JOB? Flaunter can really streamline the whole ‘call-out’ process. If I need product or images, then I can put up what I am working on and brands respond with anything they have that is relevant. This gives me the time to organize other things while the responses come in. It’s also allowed me to make contacts with brands that I haven’t seen before or haven’t had the chance to be introduced to. You get a really great array of product to look at. Find an follow Cass on her website Cass Anderson Style or Instagram @cassanderson_style. Make sure you check out Cass’ gorgeous new collection here @balincourt_.